As we age, being diligent and aware of eye screening is vital to our future vision. It is estimated that 15 million people in the U.S. have age-related macular degeneration (AMD) but won’t even know it until AMD symptoms occur. If you have a family history of macular degeneration or are (were) a smoker or if you are over 65 you may be at a greater risk for this leading cause of blindness and central vision loss. In macular degeneration, the macula, a small area in the retina, is adversely affected. It’s primary role is to provide you with the detailed, central vision that you have, allowing you to see sharply, read small print and see things in front of you clearly. The peripheral part of the retina sends vision to you in terms of general shapes and things to the side of you. If you or someone you know is experiencing some type of loss of central vision or blurriness, you may want to download this macular degeneration test, the Amsler grid, to determine if you may be experiencing symptoms. If you are, you should contact your Ophthalmologist or Optometrist to be evaluated. Dry macular degeneration is the most common form of the disease and is caused by the damaging of the tissues of the macula. Small pieces of fatty proteins form underneath the retina leading to loss of macula function. In the dry form, the disease usually progresses slowly leading to a gradual vision loss. Patients who have dry macular degeneration (dry AMD) should be careful and diligent about monitoring their central vision as this form can transition to the wet macular degeneration which is more damaging. Currently much research is being conducted for treatment for dry macular degeneration however there is no single solution at this time. It has been shown that some nutritional supplements including Vitamin C and E, Lutein and Zinc may reduce the severity and progression of the disease in certain cases. Although a smaller portion of the population has wet macular degeneration (wet AMD) it is inherently more damaging. Wet AMD begins when abnormal blood vessels occur underneath the retina. These vessels can leak fluid or blood, causing blurring of vision and distortion of central vision. Wet macular degeneration symptoms may worsen quickly. Treatment for wet macular degeneration includes Anti VEG-F medications that are injected into the eye on a regular basis. Thermal laser treatments and photodynamic therapy (PDT) have been used in the past but are not used commonly now. It is very important that you have your ophthalmologist follow your eyes once diagnosed with either form of macular degeneration. 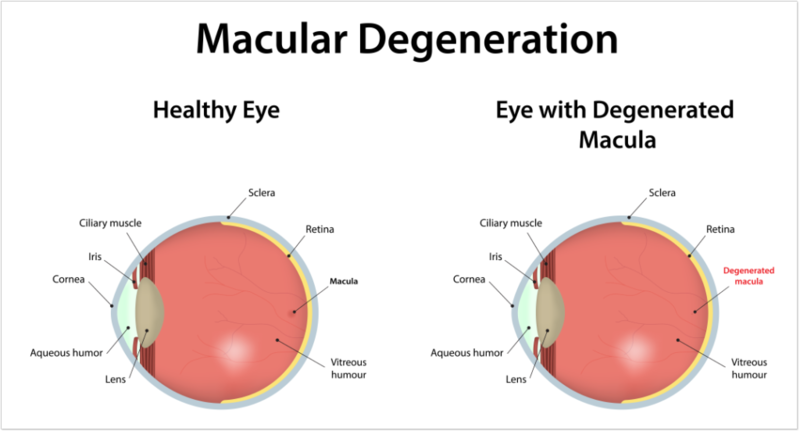 View our information on the symptoms of macular degeneration. To schedule an appointment with one of our physicians at 1960 Eye Surgeons you can call our office at 281-890-1784 or contact us online by filling out the form below.